Special 3-1 is the first level of Special 3 in Super Mario 3D Land. 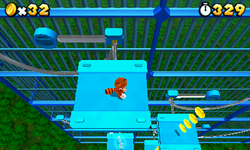 The player starts out on a platform before proceeding towards a Swinging Platform, they will have to jump off that platform and onto some Donut Lifts to get onto the next Swinging Platform. This next Swinging Platform will take the player to another Swinging Platform that will take to another platform. The player will then use two more Swinging Platforms to reach the platform that contains the Checkpoint Flag. The player will then jump onto a Swinging Platform, that is already in motion, before using a Rubber Platform to reach the next Swinging Platform that will take the player to some Donut Lifts and five Para-Biddybuds. Here, the path branches off if the player goes straight ahead they will use a Swinging Platform and a Rubber Platform to land on some Donut Lifts before continuing on in the level. If the player goes left the player will use a Swinging Platform to activate a Red Ring, that will spawn five Red Coins, if the player collects them all in time they will receive either a power-up or a 1-Up Mushroom. The path then leads to the Donut Lifts that the other path leads to. The player then needs to navigate several more Swinging Platforms before reaching the Goal Pole. Star Medal 1: In between two Swinging Platforms before the Checkpoint Flag. Star Medal 2: Above a ? Block that a Swinging Platform passes under. Star Medal 3: At the group of Swinging Platforms at the end, the Star Medal is at the end of the path the bottom left Swinging Platform takes.